Till Some years back, I tried avoiding Chinese goods. Not because I had anything against the Chinese, politically or economically, save for their environmental vandalism which now appears to be under check, but simply because I wanted to see if I could find a safety pin or a pair of scissors that had been made in India. I couldn’t. So after a long, fruitless hunt, I stopped harassing shopkeepers for made-in-India and settled for the Chinese stuff. That included almost everything—from toys, locks and toiletries to yoga mats and even the silly Christmas hats hawked at traffic lights every December. The shopkeepers were scathing about my desire for Indian goods. Why would anyone want costlier and less-finished products they wondered? For the trader, the bania who makes his money from hawking the cheapest of goods to bargain-hunting Indians, nothing has added so much to their coffers as Chinese products. That is why China will be all over our homes and economy for a long, long time. 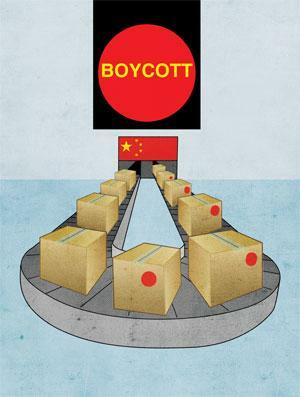 Now that the ruling Bharatiya Janata Party (BJP)’s big guns have laun ched a campaign to boycott Chinese goods, it is time we got the basics right. First, the big picture. China is India’s largest trade partner, sending us goods worth US $61.7 billion in 2015-16. This means a sixth of India’s imports are Chinese, up from a tenth in just five years ago. And what of India’s exports? These have plummeted and so sharply that it is just half of what it used to be in 2011-12: a paltry US $9 billion. Next, the range of goods that pours in from the dragon: cellphones, laptops, medicines (yes, medicines to treat TB and leprosy), solar cells, fertilisers, industrial hardware, communication equipment and shipbuilding equipment. That is not a complete list and there isn’t enough space to include the projects that the Chinese are setting up here. Would this make it simpler for the BJP ministers, members of Parliament and the national general secretary who have called for the boycott to understand that India simply cannot blot out the Chinese from our economic landscape? It may be harder to get the message across to the saffron bandwagon headed by yoga teacher Baba Ramdev and the faceless millions who carpet bomb social media sites with their boycott cries. Who will explain to them the big changes in the foreign direct investment policy made by Prime Minister Narendra Modi just a few months ago (see ‘FDI is for free dumping in India’, Down To Earth, 1-15 July, 2016) to allow Apple Inc of the US to bring used iphones from China into India? The policy change was made despite fears expressed by the electronics industry that such concessions would hurt the local industry and result in job losses. Perhaps, they are unaware, the BJP leaders and the saffron brigade, that 10 days ago, a high-level delegation from the Gujarat government was in the People’s Republic “to strengthen the relationship between China, Hong Kong and India where Gujarat will play a key role by offering avenues across sectors to enhance business relationships”, as an official statement declares. China is a key destination for the state government’s global road show to promote the 2017 Vibrant Gujarat Global Summit. So while Modi and his ministers froth at the mouth in public over China’s perfidy in supporting Pakistan over the terrorists it harbours and in blackballing our membership of the Nuclear Suppliers Group, they appear to have no qualms about letting Chinese products overrun the market. As a beginning to end this huge imbalance in trade, the government could ask Ramdev—he is after all diversifying majorly from herbal products to garments, etc—to make those little idols of Hindu gods and goddesses? And yoga mats to replace the Chinese? A cracker of a statement, would be a ban on Chinese fireworks this Diwali. Must this lady always write pro China and pro Pakistan ! How they are wrong if some nationalistic people asking for ban on Chinese goods ? We know that China is militarily and financially far more strong than India. She need not tell it again and again . Modi tried his best for friendly and cordial relations with China . But China wants enmity with India . Modi has taken step by imposing heavy duty on 93 items imported from China . The creation of the Quadrilateral Alliance of US, Japan, India and Australia could become possible only because of the wise diplomacy of Narendea Modi . This lady should feel proud of such a Prime Minister . But unfortunately she always takes pride in her anti India posture . This article is about India-China trade and the dangers in the FDI policy that allows dumping of Chinese products in our country. Foreign policy issues with China are not under discussion, much less ties with Pakistan. Since this article was published 16 months ago, trade with China has grown tremendously and so has India’s deficit. While the bilateral trade reached $84.44 billion in 2017, India’s deficit ballooned to $68.10 billion, according to a PTI report. The primary reason is that manufacturing in India has declined to an all-time low. Surely, this is not in our national interest?